Certain brands are known for quality, unique style, ultimate designs, and top products. In the air mattress industry, SoundASleep dream series air mattress is such a brand. It enjoys lots of positive reviews and also offers some of the best services to its users. We sampled up some of the best SoundASleep mattresses and settled out for the very top four. Read through these reviews to find out why these four designs from SoundASleep Series are our top picks today. Arguably one of the best designs from SoundASleep Dream Series, we chose SoundASleep Queen Sized Air Mattress to come first because of its awesome features, simplicity, and ease of use. The mattress features ComfortCoil Technology. It has 40 in-built air coils that provide it with additional support and durability to keep your bed flat and firm. In addition to that, it boasts of the patented1-click internal pump system. This makes it easy to inflate and deflate. It gives the mattress the desired firmness in under 3 minutes. For an ideal puncture resistance capacity, this design enjoys an added flocking with an extra thick touch. It is fixed with multi-layers thick fabric that makes it extremely durable. But that’s not all. To prevent this mattress from slipping, the company has designed it with the cool “Sure Grip” technology that gives it a rubber-like hold on to the ground always. Deal Breaker: However the thick flocking makes the mattress slightly weighty compared to the others but if you want a mattress that lasts, this shouldn’t be a problem. For people who want to spend slightly less and still enjoy the perfect touch of the Sound Asleep twin mattress, this Air Mattress offers the best features. Like its predecessor, this mattress comes with the Comfort Coil Technology design. However, it has 21 internal coils (20 fewer than the queen size). Even so, the coils still give the best support to its capacity and provide ideal support and durability. The mattress also enjoys the patented 1- Click Inbuilt Pump that makes deflation and inflation pretty fast and in less than 3 minutes. This twin size airbed also offers a dual chamber construction that gives it a double height design on top of its “sure grip” touch. Sure-Grip bottom gives the mattress a solid grip and prevents it from sliding from its original position making your sleep comfortable. And like the Queen Size, this mattress also has an extra thick waterproof flocking with a multi-layer touch for high puncture resistance. Deal Breaker: The air mattress is difficult to use where there’s no power available. But that’s not so much to worry about as most people never take their air mattress out. Comfort is vital for a great night’s sleep. And SoundAsleep CloudNine Series Queen Air Mattress offers exactly that. But unlike the other SoundASleep air mattresses that we have seen, the CloudNine Series comes with an integrated dual smart pump technology. The dual pump runs continuously in the background all night long and provides the mattress with a constant firmness. Additionally, the CloudNine series has an auto-shut pump that offers 3 comfort levels and automatically shuts off once the mattress attains the desired firmness. This mattress is also designed with the ComfortCoil technology and with I-Beam coils for flat sleeping space and evenly spread out the weight. Choosing this mattress also leaves you with a non-slip sure-grip design, extra thick flocking, multi-layered puncture resistant touch, and a highly durable design. You know, with the usual shebang of a SoundASleep mattress. Deal Breaker: The inbuilt electronic pump, once damaged, will need an expert to fix (you may have to ship it back to the manufacturer). However, you can prevent this by taking proper care of the mattress at hand. Finally, we’re on to the fourth product on our list that’s the SoundASleep Camping Series Air Mattress. The mattress has an I-Beam air coil design that makes it easy to sleep on and also to pump it to its full capacity. It is bestowed with the highly loved ComfortCoil Technology that gives the mattress the perfect support and firmness. Indeed, for people who love outdoor activities such as camping, hiking, and mountaineering; its Eco-Friendly PVC touch gives them a lasting value for their money. However, it is the included external “Rechargeable Air Pump” that makes this mattress to win the hearts of many users. The pump works with the help of a rechargeable battery and easily inflates the air mattress in under 3 minutes. It can also be used to easily top up the mattress in case it goes down. To sustain the harsh outdoor environments, this mattress is designed thick underside to withstand punctures and scratches. Deal Breaker: This mattress needs maximum care as the outdoor is often full of potentially damaging hazards. The best Sound Asleep air mattress like any other ideal air mattresses requires maximum care to last long. Due to this, you must keep in mind some of the tips, do’s, and don’ts that we are going to list right here. This is the very first thing many air mattress users ignore. Over inflating your mattress creates so much pressure and damages the mattress seams. Well, it is normal for an air mattress to lose some air after a night’s use or feel slightly bigger after the very first use but the two scenarios can always be fixed by adding air to the recommended level at any time. Apart from overinflating the air mattress, other people will underinflate. This is equally bad for the air mattress. As it stands an under-inflated sound-asleep air mattress can easily get damaged, sustain punctures, and easily get pierced too. It is advisable that you make use of the manufacturer’s manual. This will give you the correct levels to what your air mattress should be inflated. Washing your air mattress while deflated will prevent you from accessing every nook that could harbor dust, dirt, and debris. Even worse, the corners could easily remain wet and lead to the growth of mold, fungi, and bacteria. Laying your air mattress on rough surfaces or areas with sharp objects and broken pieces of objects could easily inflict damages to your mattress. Air mattresses are often delicate. The SoundASleep Dream Series air mattress is no different. Any small and sharp object could easily tear it. You should always watch where you put your air mattress or buy one with thick flocking on both sides of the mattress. This will reduce the pressure and also any chances of damages to your product. The reason why dump places aren’t ideal to store your Sound Asleep dream series airbed is that they accelerate the growth of mold, fungi, and bacteria. Air mattresses are made out of PVC. When folded and kept in damp places, they will easily harden up and be breeding places to these things. Therefore, never keep your air mattress in an attic, basement, or damp areas within your house. Rather keep them in warm but not too hot places. Warm places with free flow of air are the best areas to work with. I will be frank with you. Sound ASleep Dream Series air mattresses with inbuilt pumps are not your everyday cup of coffee. Generally, any inbuilt pump has a complex mechanism that needs technical knowledge to understand, service, or fix in case of damages. It is advisable that you take your mattress back to the manufacturer in case the pump breaks down so it can be fixed. That’s why we always advise most of our readers to look for warranties when buying their the best mattresses for them. Except for a few air mattress brands, the Sound ASleep Dream Series air mattress has stood above the rest. The brand is known for its stylish air mattress designs and state-of-the-art quality among other things. These are some of the features that set this brand apart. Coil beams are the best for any size of air mattresses. They spread the weight evenly and ensure that not one single side of the air mattress is overworked. However, Sound ASleep Series takes this technology a notch higher by introducing the sound-asleep air mattress with comfort coil technology. This is a patented air mattress design that uses 40 internal air based coils to add durability and support to your product. It gives your airbed a flat and firm look even when loaded to full capacity. It’s normal for air mattresses to have an internal pump for inflating and deflating the mattress. However, none has the 1-click design. One can inflate and deflate a Sound ASleep product within three minutes. All he/she needs to do is to click one switch on board. While this is common to many of the best air mattress candidates, it gives the SoundASleep Series an added advantage when combined with the first two technologies that we have talked about. An extra thick flocking on the top and bottom sides of the mattress minimizes the chances of getting a puncture and also ensures that your product remains usable for a very long time. You may have realized that a few air mattresses offer their products with a warranty. This is solely etched to the fact that they are very fragile. However, it is important to get a product that comes with a warranty. Warranties are ways to ensure a brand or a product of that brand is trustable. SoundASleep air mattresses come with a limited 1-year warranty(at the time of writing this article) which is a great show of confidence on their own products and an awesome surety for the customer. Most camping air mattresses such as the SoundASleep Camping Series air mattress may not support so much capacity. 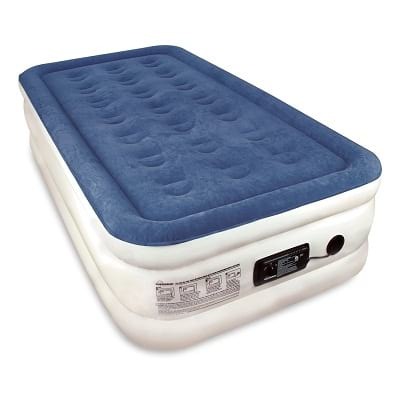 However, depending on the user’s needs, any product, if it is considered as a top air mattress, should be able to hold the recommended capacity of weight. Sound ASleep air mattress, for instance, will hold up to 300 lbs. This is an awesome capacity for up to three guests. They have been tested and found to work really well. Thanks to the comfort coil technology too. SoundASleep products have used the “Sure Grip” technology to boost the stability of their air mattresses. It provides a rubber-like-grip under the mattress. The grip prevents our mattresses from sliding. Different air mattresses vary in design and construction. However, there are a few brands that satisfy users. Sound ASleep is one of them. Nonetheless, without proper care, any mattress won’t last long. Here are some tips that could help. Every air mattress has a recommended capacity to which it should be filled with air. If you under inflate your mattress you will create uneven weight spread. This can easily wear the material and puncture it. Over inflating your air mattress will also create stress around the seams and cause the mattress to blow out or develop weak joints. It’s normal for a properly filled mattress to lose some air. Keep some unused extra space. For any air mattress to feel comfortable and also to remain durable, it needs a good mattress cover or bedding. Use sheets, blankets, or bed pads. These can easily protect the air mattress from sharp objects. It will also prevent the vinyl from growing so thin faster and keeps sweat away to leave it fresh. A clean air mattress ensures that dirt, residue, debris, and bacteria are kept at bay. It is the simplest way to care for your mattress and to ensure that it lasts longer. You can clean using a vacuum cleaner or a soft cloth with alcohol. However, make sure the air mattress is properly deflated before storing it for next use. Store the product carefully. Always lay your air mattress on a safe floor, inspect it for holes and signs of distress, fold it as per manufacturer’s instructions, and keep it in a safe container or bag. Avoid too extremely heated or cold areas always. The vital tip to keeping your mattress safe is to follow the manufacturer’s instructions. The instruction manual says how to pump your mattress, clean it, store it, and use. Therefore, never write off the user manual any time. When filled with pressure to the recommended capacity, your air mattress will have the perfect firmness. However, after sleeping in your air mattress you may notice that the firmness level suddenly changes. Here are the top 5 factors that could to happen. The location of your air mattress is the first thing that may affect the firmness of the product. If the location is full of bumps, sharp objects, cold climate, and so and so on… You will notice that the firmness going down. This may be caused by slow punctures, shrinking air pressure or uneven resting ground for the mattress. If you are in the cold winter season or a cold house, the air mattress tends to shrink. A warm room will maintain the firmness, while a room that’s too hot will easily over inflate your mattress as the pressure expands due to hot air. More or less the same as temperature, humid conditions tend to shrink up the air mattress itself and also the PVC that your mattress has been designed with. This means your mattress may feel somewhat flaccid after a while. If your mattress is new and you inflate it, it will feel a little flaccid after a while. Don’t worry, your mattress hasn’t gotten used to being inflated yet. The PVC is still stretching out to its right shape and size. You can fix this by pumping air regularly. The capacity of pressure will also affect the firmness of your mattress. If you under-inflate your air mattress you will find it uncomfortable to lie on and also very boggy. Overinflation will also make the mattress rigid and prone to puncture. Best air mattresses have specific features that will set them apart. Usually, every air mattress is unique in its own way. Here are some of the top features that will set a top air mattress from the rest of the pack. Because air mattresses are delicate, getting a product with a state-of-the-art design that lasts longer than the rest is a plus. There aren’t many mattresses on the market that will offer durability. However, an air mattress that has an extra thick flocking does exactly that. Your air mattress should be a quick fix. What this means is, in case you have visitors coming over unannounced, you should be able to fix them a quick and comfortable bed in no time. An air mattress will come in handy. Pumps make quick inflating and deflating easy. One can quickly make or break (Pun intended) the bed. They should have the capacity to fill your mattress in the lowest time possible; the 110-120 Volt Electric Pump is a good example. Some of the best air mattress pumps will come in the following features. To hold enough air and have no leaks, the best quality air mattresses are usually designed by a durable PVC material. PVC will easily hold air in them and also sustain the recommended elasticity comfortably. Other materials that air mattress have also been made of include nylon. Such materials are also easy to clean and dry in case it gets dirty. If you want the best air bed for kids then you should that’s waterproof. Waterproofing can come in form of quilted layers or extra thick flocking. This feature prevents water getting in the mattress even when your kid wets the bed. A good air mattress should come with a carry bag for easy storage and excellent portability during road trips. Carry bags make air mattresses convenient additions to your collection. SoundASleep air mattress folds in a small size that’s extremely convenient for a tote bag. Whether you have gone for the best Sound Asleep dream series air mattress or not, looking for a brand that offers the best customer care is really important. Typically, air mattresses are delicate and require proper care practices and additional recommendations to follow. In case of an emergency, you need a one on one help. You can only get this through customer support. So take your time to get the best tips on how to buy the best air mattress.